Philadelphia Museum of Art: One of the largest art museums in the U.S., the Philadelphia Museum of Art has an impressive and extensive collection of decorative arts, paintings and prints. The first Sunday of every month is "pay what you wish," so with any donation you will be able to visit. Check it out! While you're there, you can also climb the steps and reenact this famous scene from the movie "Rocky". Geno's Steaks: Philly is known for its cheesesteak sandwiches, and Geno's is one of the best. At just $9, you can enjoy one for yourself. 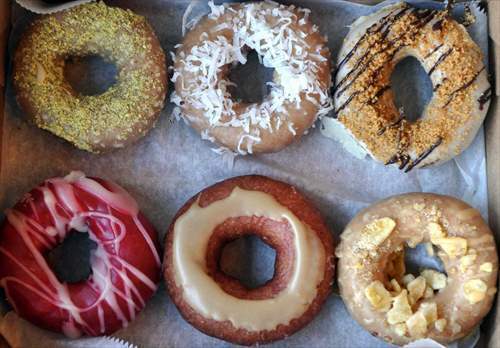 Federal Donuts: Treat yourself to a decadent yet inexpensive treat in Philly. Federal Donuts is a popular coffee shop featuring a variety of delicious donuts in specialty flavors. Try the vanilla lavender, halva pistachio, or mandarin coffee flavor! Self-Guided Walking Tour: What better way to get to know a city than taking a walk and exploring it for yourself? Get some friends together and use this free guide to roam around and learn about Philadelphia's rich history. Independence National Historic Park: Independence Hall is the meeting hall where the Founding Fathers of the United States adopted the Declaration of Independence and The Constitution. You can't get closer to history. The old cracked liberty bell also holds a great deal of U.S. historical significance. Both of these, as well as many other important historic sites, can be found at the park. Only the National Constitution Center charges admission—all other park sites are free! Valley Forge National Park: This enormous park is not only great place to walk around or spend an afternoon, but it is also the site of the winter encampment of the Continental Army (1777-1778) during the Revolutionary War in the U.S. The park contains historical buildings, recreated encampment structures, memorials, museums, and recreation facilities. Entry is free. South Street: Check out this popular spot in Philly known for lots of funky stores and restaurants. Reading Terminal Market: This historic, eclectic market has everything from hand-made jewelry and crafts, to fresh produce and baked goods. Movie Mondays at the Trocadero Theatre: This historic theater, known as "The Troc," originally opened as an opera house in 1870 but is now known for showing a variety of films and musical performances. On Mondays, they screen a movie with free admission. You can see what's playing by clicking the link. Be a Philly sports fan: Citizens Bank Park is home of Philadelphia's beloved baseball team, the Phillies. While tickets to games can be expensive, you can still take a tour of the park for just $10. The Phillies are known for their mascot, the Phillie Phanatic, a large, furry, green creature who loves to entertain the fans. Lincoln Financial Field is home of the Philadelphia Eagles Football Team, who have only had one losing season since 1999. Tours range between $8-10.